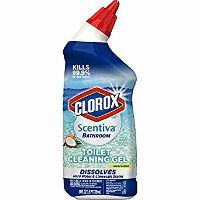 Make your toilet bowl sparkle with Clorox Scentiva Toilet Cleaning Gel, in the amazing Scentiva scent of Pacific Breeze & Coconut. The powerful cleaning gel clings to your toilet bowl as it dissolves hard water and limescale stains. This toilet bowl cleaner deodorizes and disinfects, killing 99.9% of bacteria.